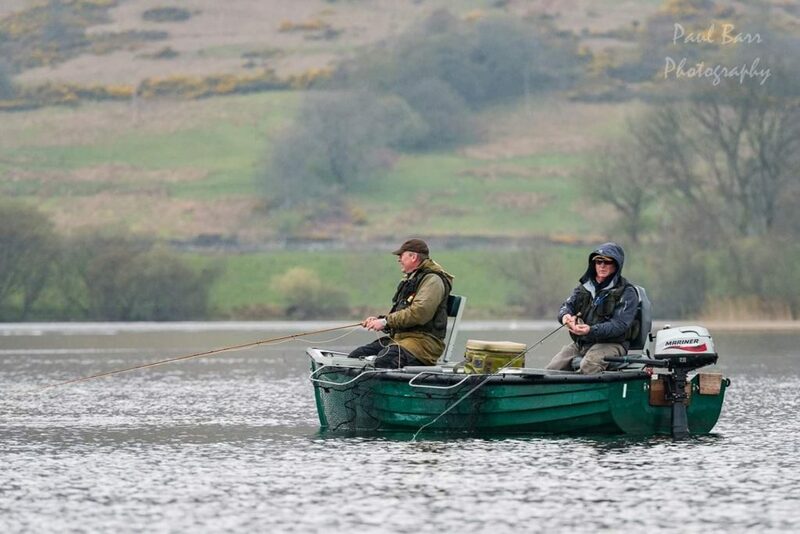 The first heat of the Scottish National Trout Fly Fishing Championship 2019, Sponsored by Ridgeline UK, 7plus7 Construction & R & E Hygiene was held on the lake today. Thankfully the strong easterly wind experienced on Monday abated slightly but the day was still on the cool side with light persistent rain for most of the session. Most of the boats headed for shallow water drifts in the Eastern Basin with some also heading to Sandy Bay and Malling. Buzzers were hatching through the day and the birds were busy feeding on them above water with the trout doing likewise sub-surface. The winner of the heat was Kevin McCabe of Change FFC. He managed to land 23 fish for a total weight of 45lbs 3.7ozs. (First three fish killed and weighed with 2lbs awarded for each fish returned thereafter). Kevin was fishing a floating line and buzzers around Shear Point. Kevin also won the corresponding heat last year with 39 fish and will be captaining the Scotland team at the Spring International at Grafham Water next month. Here’s hoping that his form continues! 2nd place went to Neill Barrett of Gilmerton FFC with 14 fish for 30lbs, 5.6ozs. Neill got his fish between the ferry pier and the shallow marker buoys on a floating line with a fab and cormorants. 3rd place went to Wayne Cram of West Lothian Fly Dressers AC. Wayne landed 13 fish for a total of 27lbs, 13.7ozs. Wayne fished Hotel Bay using a Buzzer Tip Boobies and diawl bachs. Below Kevin McCabe on right “twiddling to victory”. On Sunday the Scottish team were out practising and had 128 fish from their 8 boats. On Saturday, Falkirk FD killed 28 for 64lbs and returned a further 21 with 5 boats, IBM netted 50 with their 6 boats.